Aptamers have been increasingly applied in biomedical field as a class of biorecognition elements that possess many advantages such as high specificity and binding affinity, easy synthesis, easy modification, small size, non-toxicity and good stability. Many diseases like cancer exhibit cellular aberrations at morphological and molecular levels. Medical diagnosis based on molecular features can be highly specific and extremely sensitive when proper recognition molecule and an efficient signal transduction system are employed. However, bioanalysis of human diseases at the molecular level is an extremely challenging field because effective probes to identify and recognize biomarkers of diseases are not readily available. Traditional bio-recognition molecule, antibody has been exploited to develop excellent diagnosis assays in many formats, but antibodies are insufficient to match the requirements of fast and portable biosensors for point-of-care applications, which are at high demand in pathogenic bacteria detection as well as other diseases like cancer. Aptamers are short single-stranded oligonucleotides, which can be selected from random combinatorial library by SELEX in vitro. This relatively new biorecognition agent has superior intrinsic characteristics for biosensor development. In this review, we first present major aptamer selection technologies and the main formats of biosensors, which were frequently employed in aptasensor development. Then, the current state of aptamers as applied to medical diagnosis was discussed for specifically cancer and pathogen diagnosis. 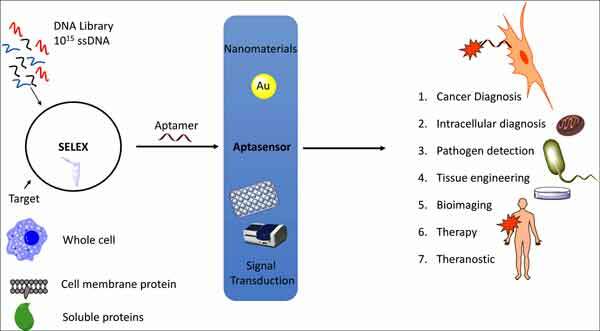 Finally, an overview of aptamer-nanomaterials conjugates was presented in many applications such as diagnosis, bioimaging, and theranostics. Aptamers, Biosensors, Cancer, Medical diagnosis, Pathogen detection, SOMAmers, Theranostic. Bayrac Istanbul Kemerburgaz University, School of Medicine, 34217, Istanbul, Turkey.